Music is a powerful tool to learn Spanish, children love music and singing and they love repetition, the best ingredients to learn! Do you remember singing all those simple nursery rhymes from childhood? If the first part of a familiar song text is given, most of us will finish singing the song, even if we sing it only in thought! As grownups, we may remember the joy experienced while singing and playing musical games with our friends. Often as we hum these melodies, we think of other songs we learned during our early childhood years, and we realize that we can still sing many of these from memory. Quality music experiences enhance listening; invite intuitive and steady beat responses. Music aids learning of vocabulary, sound and pitch discrimination, emotional responses, creative responses, memory, and can offer many hours of fun for our little ones. What powerful links to learning might we use within the many aspects of music? 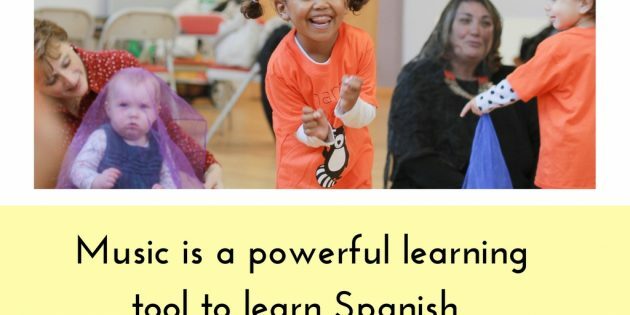 It appears that the first three years of a child’s life are critical for optimal brain development, for music, and for learning through music; using this knowledge gives us great advantage in our aim to help young children learn Spanish. Listening is necessary to hear same and different letters of an alphabet, words, sounds in our environment, and musical pitches. There will be a lifetime of sounds our children will need to identify. The sooner we encourage listening skills, the more opportunities children will have to develop them. Introducing a different set of sounds to those they are most used to through songs and rhymes will help to add them to their hearing differentiation as well as helping to memorise them. 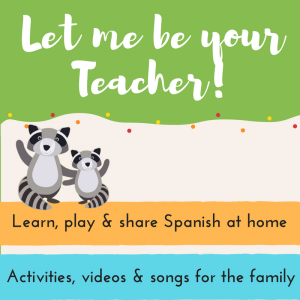 At Nanos Spanish we choose and create our own songs to complement our learning objectives, introducing topics that are of interest to our little ones. Our repertoire is carefully thought to promote rhythm, clapping, tapping marching along will help children to follow a steady beat which is essential to learn language tones too. We all know that preschoolers love repetition and that repetition is the key to learning, so take advantage of this great teaching tool to help them learn Spanish, singing the songs that they like will not only teach them new words but starts introducing grammar. Correlating actions to words not only helps children work on their gross motor skills and are good for midline activities but are also an extra layer to help them memorise vocabulary. So there you have it, keep singing and moving, it is a lot of fun to learn Spanish! If you want to access our songs, interactive videos and activities Join our Club. Nanos Spanish always has your little ones learning in mind. We create short videos where the learning objective is clear and manageable. Our videos are interactive and will make the children participate. We use visual aids, puppets, music and games to make the learning fun and effective. If you also want to come along to our classes, click here for information about our Locations in SW London.